Target audience: Nonprofits, cause organizations, foundations, NGOs, social enterprises, educators, video producers, multimedia specialists, storytellers. All of a sudden, it feels as if nonprofit video storytelling is busting out all over. Tonight I’ll be heading into San Francisco for the Storytellers for Good film festival and fundraiser. Over at TechSoup Global, the annual Digital Storytelling Challenge begins April 1 — here are the details (though the TechSoup website is experiencing a planned temporary outage). 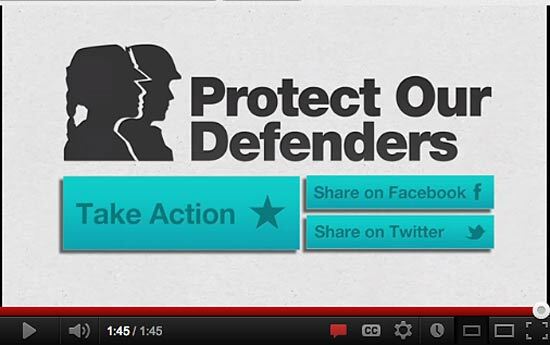 “Protect Our Defenders,” winner of the DoGooder Nonprofit Video Award among small organizations. Target audience: Nonprofits, foundations, NGOs, social enterprises, cause organizations, brands, businesses, Web publishers, educators, video producers, storytellers. If there was one buzzword at last week’s Nonprofit Technology Conference, it was storytelling. On Wednesday Debra Askanse wrote about our Future of Storytelling panel. And there were at least two or three other sessions about nonprofit storytelling. One of the most informative was the session “Sight, Sound, and Motion: Video Storytelling and Using Video for Advanced Messaging” put on by Michael Hoffman and Danny Alpert of See3 Communications, which works with nonprofit clients to create compelling video stories. Michael and Danny offered these tips on how to make your visual story work — and I’ll second all of these recommendations, since I know a little about video production. 1Here’s one of the biggest shortcomings of far too many videos. Settle on a single message — not three, not two. One. You don’t need to cram your organization’s entire message into a single video. Be selective. The more messages you include, the more muddled it becomes. Marketing folks have lived by this rule for decades. 2You’re creating your video for a reason, right? It’s not to communicate to your staff. Or even to the public. “There’s no such thing as the general public,” Michael said. Target your audience and speak to them. Frame the story in a way that touches and appeals to those people.